This political biography/autobiography offers a unique look into the political beliefs and motivations of Professor Sison, renowned revolutionary leader, writer, poet and founder of the Communist Party of the Philippines (CCP). This collaboration between Sison and American Book Award winning novelist, Ninotchka Rosca, goes far to illuminate the political climate and historThis political biography/autobiography offers a unique look into the political beliefs and motivations of Professor Sison, renowned revolutionary leader, writer, poet and founder of the Communist Party of the Philippines (CCP). This collaboration between Sison and American Book Award winning novelist, Ninotchka Rosca, goes far to illuminate the political climate and history of the United States' role in Filipino politics. In the frank exchange between Sison and Rosca regarding the Filipino revolutionary movement, the issues of women's rights and empowerment within the CCP, as well as ethnicity, class, age and education, are also addressed. 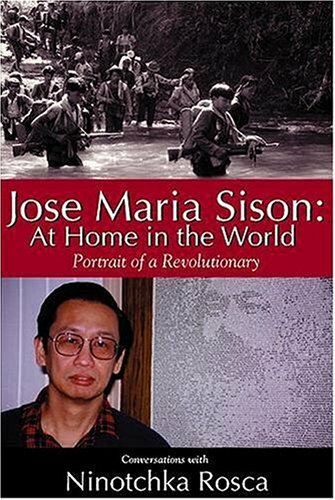 In light of the upcoming US presidential election and the controversy surrounding terrorism and the Bush Administration, Jose Maria Sison: At Home in the World - Portrait of a Revolutionary is a book that can offer the "other side" of the story, chronicling the life of a Filipino revolutionary, his political party and his country, untouched and unfiltered by outside political propaganda. Sison's responses are interesting in their sharpness and terseness, but they were dug by Ms. Rosca's penetrating questions. Awesome read. The book is done in question and answer format with the author Ninotchka Rosca and Communist Party of the Philippines (MLMZT) founder Jose Maria Sison. The book covers his years as a student activist and leader, his time as a professor, his activity in the underground movement under Marcos, his imprisonment, and his time spent in exile from his homeland. I worked on the PR for this book for a year, so I'm probably kind of biased. If you are interested in the Philipines, and Filipino politics, this is a good read. It's dry, but not too hard to read because it's written in a Q&A format with Rosca interviewing Sison. I don't agree with all of the views in the book, and it's very obvious that Sison molds history to suit his story of being exiled to the Netherlands, but it's a story of a world very different from our own. Been waiting for a book like this. To add to it, this book has a commentary from Ninotchka Rosca.More than anything else, it would be something to learn what drove men like Joe Marie Sison to embrace communism and ironically in a country like ours. The life and political convictions of a Filipino ideologue.